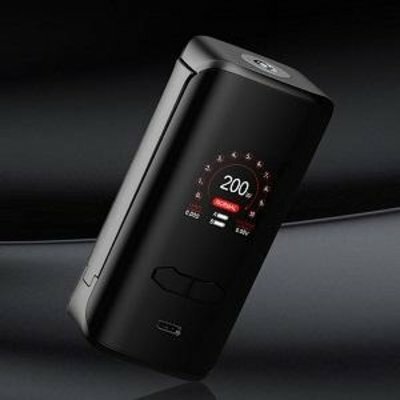 The VX200 Box Mod is an extremely lightweight device you have to feel to believe. The VX200 features a gorgeous 1.3 inch OLED screen and sleek curved panels and weighs in at a delicate 65 grams. The Augvape VX200 Box mod has four distinct output modes: variable wattage mode, variable voltage mode, temperature control mode, and bypass mode. Variable wattage output has a range of 5 to 200W and features normal, soft, and high power output settings. Variable voltage output has a range of 0.5 to 7.2V while temperature control has a temperature range of 200 to 600 degrees Fahrenheit, compatible with titanium, nickel, and stainless steel and TCR Mode. The rounded edged panel of the VX200 has a 1.3 inch OLED screen with 240 by 240 screen resolution. The settings allow the user to change the color of the theme by adjusting red, green, and blue levels. This display shows output wattage, power output mode, dual battery life indicator, radial vape time counter, atomizer resistance indicator, radial vape time counter, and voltage output. VX200 has a three button control interface with two adjustment buttons and a side panel firing button. 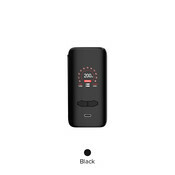 This box mod uses two 18650 batteries (sold separately) and is stored using a magnetic back panel. The VX200 features ABS and Poly Carbonate construction.